New and now available on Amazon! Return, the much-anticipated fourth and final book in the popular Guardian series is now available. Full of passion, romance, and surprises, this story will leave readers believing in fate, connection, and the transcendent power of true love. When Declan first fell for Alexander at San Mar High, she knew it was an attraction like no other. That was how it all began in Guardian, the first book in the popular Guardian Series, and readers were captivated by Declan and Alexander’s story and the deadly obstacles they had to overcome for love. Now, in Return, the story continues as they’re drawn to San Mar once again, this time to confront their past and connect with those they left behind. But the power that bridged mortality to bring them back also brought dark consequences, and there are secrets to be discovered that will affect them all. As the countdown to danger unfolds, the only thing they can rely on is the timeless bond they share and their fierce determination to protect the ones they love. Sign up for info on new releases! Book 4 Title and Cover Reveal! 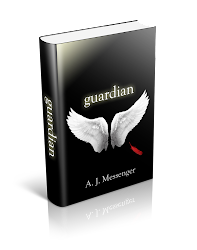 Guardian Series now available on Amazon!